In 1953, Ettore Caorsi, primo ballerino and teacher at the Rome Opera, wrote that "in modern times, amongst the great dancers and teachers who have blazed a trail for Italian art in the world, there must stand, in the very first rank, Nicola Guerra, a noteworthy choreographer as well". That essay, published in the journal Il Cigno , dealt with Guerra’s career as teacher and choreographer for Europe’s major theatres (Vienna, Budapest, Paris, Rome, Milan). In Hungary, where he led the ballet from 1902 to 1915, Guerra was made a Knight of the Order of Saint Stephen, and in 1929, France made him a Chevalier de la Légion d‘honneur. Caorsi’s article ends tersely though: "In Italy [Guerra] has been quite forgotten". Having lost all his property in 1917, when he refused to take Austria’s side in the World War, Guerra is believed to have left his teaching post at La Scala in 1924, on account of his opposition to the Fascist Party. Although this writer, unfortunately, never met Nicola Guerra (he was born at Naples in 1865 and died at Cernobbio in 1942), thanks to the kindness of his family members, who live near Como in Northern Italy, I have had the opportunity to consult Guerra’s personal archives. In addition, between 1997 and 1999 I interviewed several of his pupils, including the Italians Franca Bartolomei, Lia and Ugo Dell’Ara, Susanna Egri, Bianca Gallizia, Nives Poli, Walter Zappolini, Carola Zsalai Zingarelli, and the Frenchman Edmond Linval, etc... As I followed the trail of the master’s work, it soon became apparent how unfairly he has been written out of art history – and not in Italy alone. Without speculating on the reasons for the silence that now surrounds Guerra’s role, I would venture to suggest that it had nothing to do with his stormy, awkward personality, nor with his sojourn in various European theatres, that generally proved to be brief. 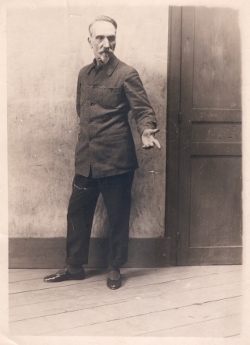 When Rouché appointed Guerra to direct the Paris Opera Ballet from 1918 to 1922 and then again, from 1927 to 1929, he did so, aware that Guerra, preceded by his high reputation, was a man of taste who would invent choreography that rested on a firm foundation. 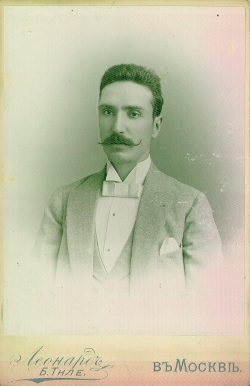 Moreover, Guerra was known to be forward-looking, a man of modern times. Although Italian, Guerra was in point of fact, a product of the finest French academic tradition. He had studied at Naples under Aniello Ammaturo (1820-1880), a pupil of Blasis, and of the Frenchman August Hus. Guerra was a remarkably cultivated man, sensitive to music and to other art forms; he was also an original writer, having published a series of novels set in the dance world. "As it happens, when it comes to schooling, there is no difference, and if one there be, it concerns form alone. in all events, that form was fully assimilated by the Italian School a century ago, during the Golden Age of dancing. Jacques Rouché deemed Guerra to be the man who would restore the Paris corps de ballet to its former glory, and endow it with a rich and varied repertory. One of Rouché’s central concerns was to reform teaching at the Opera, and bring it up to date both from a practical, and from a methodological standpoint. Nor did Rouché err: Guerra proved to be - as he had largely proven elsewhere - the right man in the right place. The Examination (now known as the Concours) for the Opera corps de ballet was then compulsory. Central to a dancer’s career, the event was also scrutinised as the benchmark for quality in teaching. Held every December, it was closely followed by critics such as André Levinson. 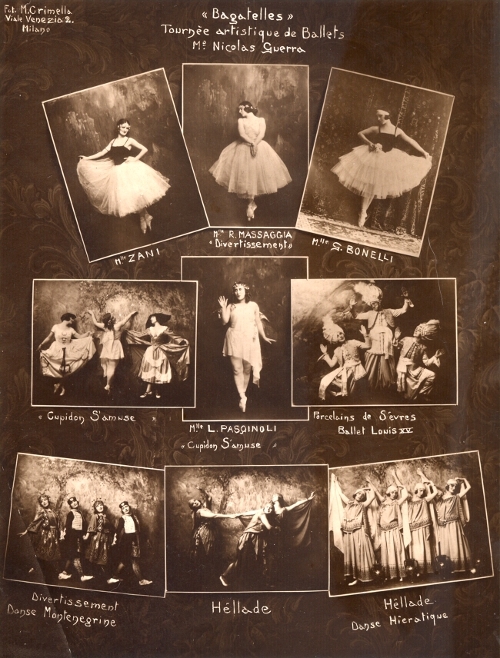 Though generally rather dour, the latter found that the corps de ballet under Guerra’s direction had not only improved technically, but had acquired a fresh spirit of enthusiasm and discipline, as shown by the brisk competition between the dancers, who had awoken with a start from decades of drowsiness . It was Guerra who insisted that the grands sujets sparring for appointment to Premier danseur should present not only a compulsory variation, but an original piece of choreography. This too met with the awkward Levinson’s approval. In the rue des Martyrs (9th arrondissement), Guerra opened a private studio. Letters addressed to Guerra in the family archive disclose the names of regular pupils, amongst them Lycette Leplat (later Darsonval), Solange Schwarz and Lucienne Lamballe. After one had got over the awe inspired by his haggard, inquisitorial features, a pupil would quickly find that with Guerra, dance, rather than being "an academic subject", expressed "the harmony of the soul" Vivere musicalmente , parchment given by the students of the Teatro dell’Opera to Nicola Guerra (Roma, 13-6-1932, Anno X- AG).. In 1928 Guerra drafted a Méthode that the teachers of the Première et Deuxième Classe Elémentaire at the Opera were rigorously to follow. Guerra intended to lay the foundations for a method that was to be applied from the very youngest children on upwards, if it were to bear fruit. An experiment that was nipped in the bud, as the Opera was shortly to dispense with his services. Tensions that had arisen with Albert Aveline and Léo Staats, as well as disagreements over the logistical and financial side of the new Créatures de Prométhée that Rouché had asked him to choreograph, led Guerra to resign from the Opera in 1929. His place was instantly filled by Serge Lifar, a dazzling youth whom Rouché had seen in The Prodigal Son, and whose career as a choreographer, Diaghilev had launched in a new version of Stravinsky’s Reynard. Herebelow, the Instructions and Exhortations taken from Nicola Guerra’s Méthode. NB: all the quotations from Guerra in the present essay were originally penned in the ballet master’s idiosyncratic French. Consequently, and insofar as the lines below are concerned, slight misunderstandings may be unavoidable. 1. That the feet, no matter their position on the floor, shall not be excessively turned out, in other words, [on no account] may they be pressed beyond a horizontal line [in Guerra’s day, it was common practice to force the turnout, leading to hyperlodosis in the lumbar spine and pronation - editor’s note] . 2. That the fifth position shall be well-closed, but on no account may the [front foot] pass beyond the heel of the other; this is true of all movements, and both in the take-off and landing phase of a jump. 3. That the plié shall be taken softly, moderately and without stops-and-starts. 4. That in poses, the knees shall be well-stretched, while in temps de batterie, entrechat-quatre, entrechat-six, etc. they shall be slightly relaxed, so that the legs may cross properly, and these movements sparkle. 5. That the gesture leg, whatever its position en l’air, shall be lifted neither too high, nor too low [relative to] the line of the hip-joint. 6. That the torso shall be held firmly upright, and most especially, on its line of aplomb [relative to] the standing leg in adagio. 7. That in attitude derrière, the thigh shall be properly lifted with the shin bent inwards; neither shall the torso be allowed to over-incline forwards or backwards. Failing which the lack of balance will make it virtually impossible to turn in that position. 8. That the toe-tips shall be pointed, and stretched to their fullest extent [i.e. not curved under like a parrot’s beak]; on landing from the airs, the toe-tips (and not the demi-pointes) are the first to touch the floor. 9. That in plié, the heels shall never be allowed to leave the floor first, but shall be kept down as long as possible following the initial bending of the knees. 10. That the heels, on each plié, shall be opened to the fullest degree possible, while the torso shall be held on its line of aplomb, that line which unites the two heels, viz. the centre of oneself. 11. That the head shall be lifted from the shoulders – but without arrogance – the shoulders held nicely low as nature requires, and firmly held in the back (‘bien serrées en arrière’ - Guerra may actually have meant "pinching the shoulder blades together" as was the practice then – editor’s note). 12. That in every pose, the arms shall be nicely rounded, without affectation, and as though effortlessly; they shall accompany the leg movements harmoniously through the various attitudes, en l’air and à terre. 13. That the jumps be elastic, moelleux and light. Be patient – especially in the elementary class – make corrections exactly when the problem arises, and do not fear to stop the class if need be, since in an Academy, there is no hurry! Do not allow the children to stand on the tips of their toes, and in all events, after the first two or three months’ study, try and see whether the child is able rise with ease from the demi-pointe to the very tip of the toe. Do not allow children to stand on a single pointe: at the very most, they may do échappés and pas de bourrée mais toujours avec les temps. As I have already explained, in the 2nd class the child will learn batterie, tours and exercises on pointe, but not beyond a certain level of difficulty. The more advanced levels will be dealt with those who teach the 3rd and 4th class, to which the child will be promoted only after several years’ study. Take great care that on the ground, the foot be at its full extension [i.e. not clutched or pinched – editor’s note], and that the little-toe side be held still more firmly than the big-toe side [since pronation] will become a most serious flaw when it comes to the overall requirements of our art. Virtually all adagio exercises shall be preceded by a plié fondu. The pas d’allegro (grand et petit ballon) [these are Guerra’s terms for grand allegro and petit allegro – editor’s note] [shall be preceded] by a demi-plié, so as to acquire that elasticity which, joined to "natural" gesture and an body-line [placed with] elegance, lays the foundation for that Sylph-like lightness that both the male and the female dancer are called upon to acquire. Again, I speak to the teachers of the elementary levels here – it is they, who are the architects of the greater, or lesser, perfection of the future dancer. In the words of Ch Blasis, the most eminent master to follow Noverre and Gardel: "Everything depends on the very first elements: a bad habit once acquired, to weed it out will prove nearly impossible." Ettore Corsi, "Un grande maestro di danza: Nicola Guerra", in Il Cigno, Rivista mensile della Danza, del Balletto e della Musica, a. I, n. 2 s.i.d. (1953), p. 70. 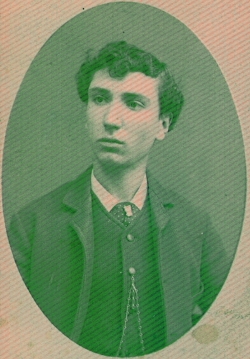 Born to a Tyrolese family that had settled at Modena, Ferdinando Valpot was celebrated as a primo ballerino assoluto. He danced alongside Elisa Albert-Bellon in the Conte di Montecristo by the choreographer Giuseppe Rota at the inauguration of the Teatro Comunale di Reggio Emilia on 21st April 1857. Auguste Hus II (1769-1824) o Auguste Hus I (1735-1829). The celebrated Hus dynasty had begun as itinerant mountebanks – actors, dancers and playwrights - active from the 17th Century on. Pietro Hus (1810-1880) was maître de ballet at the Teatro San Carlo. N. Guerra, "Danse: l’école italienne, l’école française et l’école russe", in Opéra, 11 janvier 1929, p. 57, (Archive Guerra-AG). A. Levinson, "Precisions sur la danse. Le Concours de l’Opéra", in Comoedia, 21 decembre 1928, AG. Léone Mail (1916-2001), maître de ballet, first Inspector of Dance to the French Ministry of Culture. Note dated 10th January 1988 entitled « Histoire de la Danse et Tradition » (Private collection of Private Collection of Katsumi. Morozumi.). G. Manacorda, "Danse classique ou Danse Moderne? Interview de M. Guerra, directeur de l’Académie de Danse à l’Opéra de Paris", in Illustration Théâtrale Internationale [s.d. ], p. 135, AG. N. Guerra, Méthode à suivre strictement par les Professeurs de la première et deuxième classe élémentaire soit des jeunes filles, soit des petits garçons (Paris, février 1928, Bibliothèque Nationale de l’Opera, Fonds Rouché, Pièce 166).